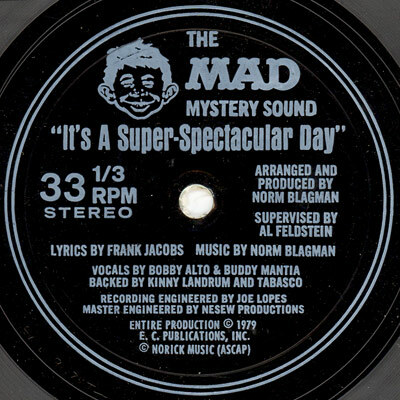 Pressed on flexi disc, it played a standard introductory section about the start of a wonderful, “super-spectacular” day, then depending on where the needle was originally dropped it would play one of several different comedic “bad” endings to that day, involving such topics as alien abduction, zits, and the horrors of a visiting mother-in-law. This multisided record effect was achieved by providing eight parallel grooves on the flexi disc surface. The songs were written by Frank Jacobs, MAD Magazine’s longest-tenured writer and renowned for his poetry and song parodies. They were performed by the Brooklyn-based comedy duo Alto and Mantia (Bobby Alto and Buddy Mantia). 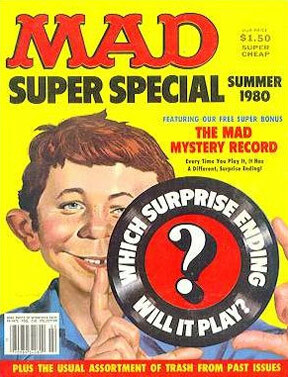 The song was aired as early as January 1980 on the Dr. Demento show before being published by MAD Magazine. All endings are included in the downloadable file.